Per my Mum's request here are some picture of my little bump. I still can't believe I'm 5 months pregnant. So many people have mad comments that I am "Tiny" for 5 months. I'm still only around 176 pounds- I wonder what size I'll actually be post birth. Sorry the pictures are so crummy- it's hard to take pictures of yourself. AS of 35 mins ago I am now 19 weeks pregnant. Holy mother. I can't believe I am halfway there. Only 4 more months... I am soooo not ready for this. But then- is anyone? 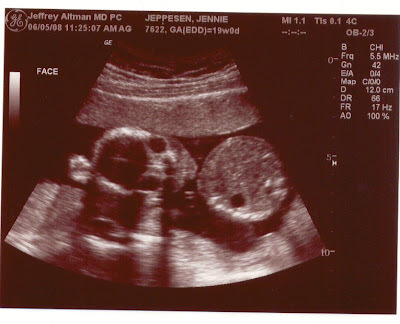 I had my ultrasound today and it's a girl. It's a mixed bag of feeling. I'm happy, and can now bond with my little girl, however I am disapointed too for the boy I though- now I was CONVINCED- I was carrying. I guess because with a boy I could try and give him the things the "sperm donor" liked to do, whereas with a girl the pages are empty- I have NO idea what to do. I guess thats wht everyone says that you don't get instructions with a child! So I woke up 2 or 3 days ago to find I suddenly have a belly. A round little bump hanging out front. I suddenly look very pregnant. In spite of "growing" in front, I've lost a lot of weight and haven't put a whole lot back on. It's partially my change in diet (fruit and veggies are the only stuff that stays down)and partially all that throwing up. I'm eating and not loosing any more which is good though. I got reaslly excited when I tried on maternity pants because it means I've dropped 2 pant sizes (prepregnancy pant sizes that is). Woot!